A little more than a year ago, a highly venomous yellow-bellied sea snake was seen slithering on the sand in Newport Beach south of Los Angeles. It was the third report of the species since 2015, according to an article in the LA Times. On the positive side, sea snakes rarely bite humans. And, when they do, they don’t deliver a lot of venom. Folks working on fishing vessels in many tropical locations encounter sea snakes in their nets on a regular basis. Fishermen carefully remove the snakes and set them free. Unfortunately, a 23-year-old British man was killed last fall on an Australian prawn trawler when he was bitten while trying to remove a snake from a net. It was the first death of its kind in Australia since 1935, according to a researcher quoted by the Australian Broadcasting Company. Steve Fisher, an underwater photographer who lives in Bremerton, told me about a few encounters he had with sea snakes while diving near Palau Manuk — also called “Snake Island” — in Indonesia last fall. It’s a place known for hundreds of green sea snakes. The snakes tend to congregate around volcanic vents where the water is warm, Steve said. He likes to go night diving to capture images of exotic sea creatures in the glare of his lights. 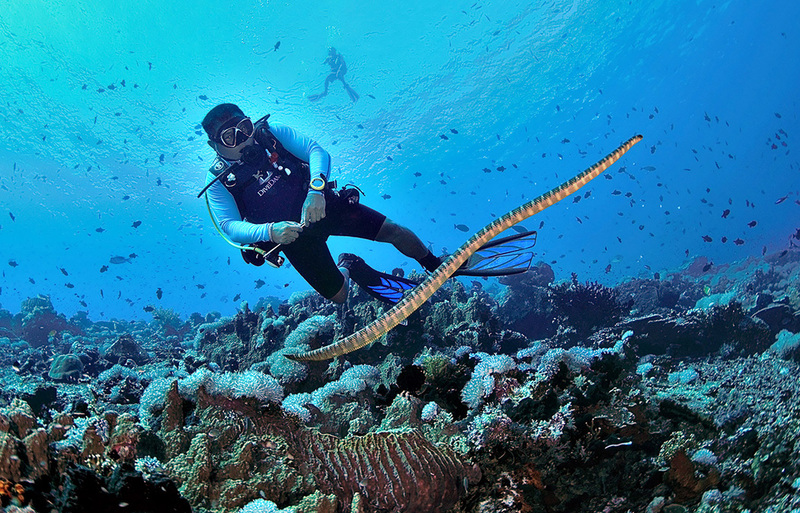 But the diving guides leading the dive trips in Indonesia made it abundantly clear that they would not immerse themselves during congregations of sea snakes after dark. During daylight hours, Steve spotted as many as three snakes at one time swirling around together, but he never got to see the legendary “balls” of hundreds of snakes intertwined together at one time. Steve said he counts on relatively slow reactions from the sea snakes and other potentially dangerous creatures that he encounters on his dives. That way he can capture his best photos of sea life. “I’m kind of a fool when it comes to wildlife,” he told me. “When they are laying on the bottom and resting, I will reach over and touch them, causing them to look at me.” That’s when he gets the shot. I became interested in this subject of sea snakes a few weeks ago after reading a new research paper about how the snakes keep themselves hydrated. Sea snakes are evolved from land snakes, which means their blood is based on freshwater and they breathe through lungs, not gills. Sea snakes are seen swimming to the surface to take in a breath of air, although some apparently are able to absorb some oxygen from the water through their skin. But if they never return to land, how do they get enough freshwater to keep their bodies functioning? Sea snakes have long been known to have salt glands to help excrete excess salt in their blood, and some scientists speculated that the snakes could be drinking seawater. But previous studies concluded that the salt glands are too small to excrete all the salt in the water needed for proper hydration. The answer to the question of how the snakes get enough freshwater apparently is that they drink rainwater from the sky. Harvey Lilliwhite, a biology professor at the University of Florida, was studying yellow-bellied sea snakes in Costa Rica with his colleagues when the six-month dry season suddenly ended with a deluge of rain. The researchers had already captured some snakes before the rain fell, and they captured others afterward — 99 snakes in all. Each time they brought snakes into the lab, they offered them a drink of freshwater. About 80 percent of snakes that were captured before the rains would take a drink, but that percentage declined as the rains continued. Only about 13 percent wanted a drink when captured eight days after the rains started. The research paper was published in the journal Plos One. By the way, the snakes were released after the experiment. So far, Lillywhite has not observed the snakes drinking water in the wild, but the presumed source of supply is the thin layer of freshwater that temporarily becomes layered over the heavier seawater when it rains. With wave action, the freshwater tends to accumulate in discrete locations, called lenses. How do the snakes find these lenses of freshwater? How thick do the lenses need to be for the snakes to drink? Do lots of snakes suddenly come to the surface all at once when it rains? And what does the future hold for these specialized creatures, as climate change extends the periods between rainfall events? These answers must come later. Jake Buehler, a writer with National Geographic, provided a nice account of the research with additional perspectives from folks not involved in the study.